After watching the Crimson Tide roll LSU in the BCS title game, I watched 30,000 Alabama fans unleash the Rammer Jammer taunt on the Bayou Tigers. It’s juvenile, opposing fans hate it, but it’s completely awesome. That got me to thinking about the best chants, taunts, and rally calls in the HBCU world. Admittedly, I have not visited every HBCU’s home stadium/gym so I am sure that there are a ton of chants, taunts, and rally calls that are worthy of Top 10 consideration but not included in the list below. The only prerequisite needed to make the list below is that the chant, taunt, or rally call must have words attached to it. So without further ado and in no particular order, here are my Top 10 HBCU chants, taunts, and rally calls. I’m So Glad –Tennessee State’s “I’m So Glad” is the granddaddy of HBCU chants. It’s not an original composition but it was TSU that first introduced this arrangement to the band world. And if imitation truly is the highest form of flattery then TSU should blush constantly as nearly every HBCU band play a version of this tune these days. Get Up for the Bulldogs – Adopted from P-Funks “Get up for the Down Stroke”, South Carolina State’s “Get Up for the Bulldogs” is everything that you want in a college chant. The words are easy to grasp, it get’s the Bulldog faithful energized, and it’s extremely catchy. I have even had to make myself stop chanting this tune more than a few times in matchups between SCSU and my beloved Wildcats. Aggie Pride – …two simple words that say so much. North Carolina A&T alums are an extremely proud bunch and for very good reason. The institution is rich in academic, cultural, and athletic history. This rally call serves as both public praise to a fellow Aggie for his/her accomplishments as well as a reminder of NCA&T’s rich history. J-S-U Rock the house – Okay, so Grambling claims to be the first to jam the “G-S-U rock the house chant”, but it was Jackson State who rocked it best! Sorry Grambling but the Sonic Boom wins. if you aint a Ram; then you ain’t $#!+. I hate everything about this taunt but by definition, that’s what makes a taunt great. It’s suppose to get under the skin of the opposition. 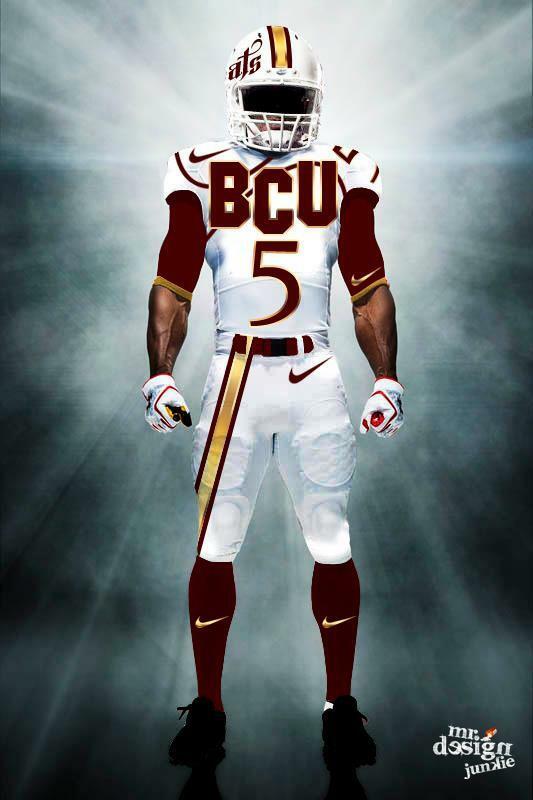 Hail Wildcats – This Bethune-Cookman chant is sometimes used to promote crowd participation, sometimes used as a taunt, and sometimes used as a rally call to offer praise to fellow BCU alums. Hail (insert opposing team’s name); Hell No! Behold – “Behold the Green and Gold” is heard at the conclusion of the opening fanfare of the Spartan Legion’s halftime shows. But this rally call makes the list for its usage as an at-a-boy to fellow Norfolk State supporters. It’s crude I admit but to the victor go the spoils. From those hard charging running backs. RATTLERS WILL STRIKE, AND STRIKE AND STRIKE AGAIN! Let’s Go Wildcats – Not much needs to be said, just take a listen. 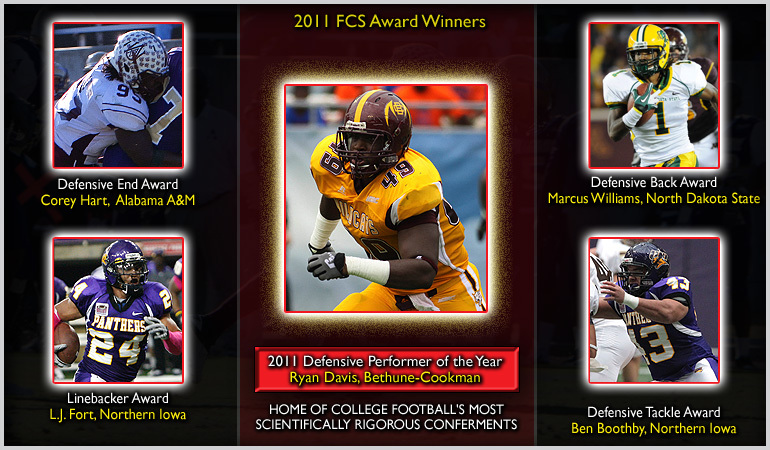 Ryan Davis has been recognized as the 2011 FCS National Defensive Performer of the Year by the College Football Performance Awards (CFPA) association. This is the most notable award on a national scale for a Bethune-Cookman football player since Rashean Mathis received the 2002 Buck Buchanan Most Outstanding Defensive Player Award. In addition to the CFPA National Defensive Player of the Year, Davis has earned spots on six separate All-American teams and was named as the 2011 MEAC Defensive Player of the Year. BCU kick returner and running back, Angelo Cabrera took first place in the indoor 60 meters at the Orange and Purple Winter Classic hosted by Clemson University in December. Cabrera won the event with a time of 6.77 seconds. Former BCU Quarterbacks Coach, Joe Dailey, has rejoined his mentor Turner Gill at Liberty University. This will be the third time Dailey has worked under Turner Gill, after serving as on-campus recruiting coordinator at Kansas in 2010. Dailey also served two years under Gill at Buffalo, one as tight ends coach and the second as offensive graduate assistant.